Be part of the conversation taking part in Carmarthenshire. What are we doing in Carmarthenshire? One of the first tasks for the Public Services Board (PSB) was to undertake a Well-being Assessment in Carmarthenshire. We have done this in partnership with Ceredigion and Pembrokeshire to ensure a consistent approach across the Hywel Dda area footprint. The Carmarthenshire Well-Being Assessment 2017 outlines what well-being looks like in the County and what Carmarthenshire’s residents and communities want well-being to look like in the future. The assessment explores key issues which positively and/or negatively impact well-being and provides a basic overview and understanding of the nature and levels of well-being in Carmarthenshire. This initial assessment provides a foundation upon which we can build a greater understanding of well-being for our citizens and communities going forward. 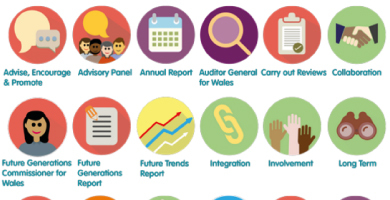 Following consideration of the findings of the Well-being Assessment and engagement events, we developed our Draft Carmarthenshire Well-being Plan. Views on the draft plan were invited during a consultation period which ended on 3 January 2018. We considered the Consultation and Engagement Report produced following an analysis of all responses received and amendments were subsequently made to the draft Plan. We approved the final Carmarthenshire Well-being Plan on 2 May 2018. This Plan will outline how we will work in partnership to address some of the key issues affecting the well-being of the citizens and communities of the County. An innovative, productive and low carbon society which recognises the limits of the global environment and therefore uses resources efficiently and proportionately (including acting on climate change); and which develops a skilled and well-educated population in an economy which generates wealth and provides employment opportunities, allowing people to take advantage of the wealth generated through securing decent work. A nation which maintains and enhances a biodiverse natural environment with healthy functioning ecosystems that support social, economic and ecological resilience and the capacity to adapt to change (for example climate change). A society in which people’s physical and mental well-being is maximised and in which choices and behaviours that benefit future health are understood. A society that enables people to fulfil their potential no matter what their background or circumstances (including their socio economic background and circumstances). Attractive, viable, safe and well-connected communities. A society that promotes and protects culture, heritage and the Welsh language, and which encourages people to participate in the arts, and sports and recreation. A nation which, when doing anything to improve the economic, social, environmental and cultural well-being of Wales, takes account of whether doing such a thing may make a positive contribution to global well-being.